Martyrdom anniversary of Captain Raja Muhammad Sarwar Shaheed was observed on Wednesday. 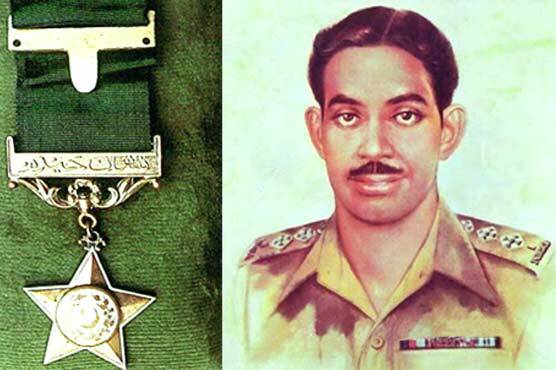 Captain Raja Muhammad Sarwar holds the distinction of being awarded the Nishan-e-Haider, Pakistan’s highest military award, for the first time in the country s history, owing to the tremendous valour that he displayed in the battlefield during the war in Kashmir and achieving martyrdom in the process. Raja Muhammad Sarwar was born in Singhori village in Gujar Khan Tehsil on November 10, 1910. His father, Raja Muhammad Hayat Khan, served in the British army as a constable. Raja Sarwar obtained his early education from Islamia High School in Faisalabad. He had three brothers and one sister. He was married in 1936 and became a father to a son and a daughter. He entered the army as a sepoy in April 1929 and served in the Baloch regiment till 1941. He was commissioned in the Punjab regiment in 1944 and also got promoted to the rank of Second Lieutenant that very year. As he along with his battalion continued moving forward, the intensity of gunfire, grenade attacks, and mortar fire increased. He received martyrdom on July 27, 1948, after receiving multiple shots on his chest as he attempted to cut a barbed wire barrier while making an effort to progress further into enemy lines. In recognition of his courage, Captain Sarwar was awarded the Nishan-e-Haider by Pakistan army.